In a career spanning more than 35 years, Bill Garmer has had extensive courtroom and appellate experience. Not only has he secured many successful settlements and verdicts for his clients, many of his successful cases have led to groundbreaking decisions. In 2016 Bill Garmer successfully argued a land mark case before the Kentucky Supreme Court, where the Court affirmed a jury verdict for punitive damages in excess of one million dollars for the family of a man who died as a result of medical malpractice. The Court in its opinion changed the laws focus in punitive damages cases to more thoroughly consider the fact that the conduct of the defendant was "Reprehensible." In Hilen v. Hays, as the plaintiff's attorney, Bill earned a victory before the Kentucky Supreme Court leading to the adoption of Comparative Fault in Kentucky. Additionally, as the plaintiff's attorney in Williams v. St. Claire Medical Center, Bill's successful argument in the Kentucky Court of Appeals led to the decision recognizing both the doctrine of apparent agency of independent contractors in hospital cases and the independent liability of hospitals for failing to follow their own rules and regulations. As a plaintiff's lawyer, Bill is dedicated to protecting the rights guaranteed to every citizen by the Constitution. Bill was one of five attorneys selected to the trial team to represent the families of the passengers of Comair Flight 5191, which crashed on takeoff from Lexington, Kentucky in August 2006. Bill recently represented the family of a victim of nursing home abuse resulting in an $8 million jury verdict in Louisville. Bill holds a Bachelor of Arts from the University of Kentucky. He attended the University of Kentucky College of Law where he earned his Juris Doctor in 1975. After being admitted to the Kentucky Bar in 1975, he worked for two years as a Law Clerk to Hon. B.T. Moynahan, Jr., Chief Judge of the United States District Court for the Eastern District of Kentucky. 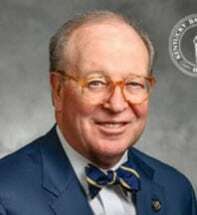 Bill was selected to the University of Kentucky College of Law Hall of Fame in 2014 and is immediate past President of the Kentucky Bar Association. Bill is a member of a number of professional organizations, and has held influential positions within these organizations. He is a Fellow of the American College of Trial Lawyers and of the Pound Foundation, and is a member of the Melvin Belli Society. He is a member of the American Bar Association; the American Association for Justice, where he has served as Chair and Vice Chair of the Council of State Presidents and was on the Board of Governors from 1988 through 2010; the Kentucky Bar Association, where he has been a member of the Board of Governors since 2011, Vice President from 2015-2016, President Elect from 2016-2017, President from 2017-2018; the Kentucky Bar Foundation; the Kentucky Justice Association, where he has served as President, Vice President, Secretary, and Treasurer, and is presently on the Board of Governors; the Trial Lawyers for Public Justice; the Southern Trial Lawyers Association; and the Federal Bar Association. In addition to his professional memberships, Bill has received outstanding recognition within the legal community. In 1998, he was the recipient of the Kentucky Justice Association's Trial Lawyer of the Year Award. Martindale-Hubbell rates him AV-Preeminent®*, the highest rating an attorney can receive. He has been listed in the publication The Best Lawyers in America since 1987, Who's Who in American Law since 1991, named to Kentucky Super Lawyers since 2007, and in 2008 and 2010-2017 was named to the "Super Lawyers: Top 50 Kentucky Lawyers" list. He has been an adjunct professor at the University of Kentucky College of Law in litigation skills since 1981 and in healthcare law since 2003. He also has been a guest lecturer in Continuing Legal Education programs in Kentucky and around the United States. Bill served on Active Duty in the United States Air Force as a Staff Sergeant from 1969 to1973. He was a Deacon, moderator of the Diaconate, and is now an Elder in the First Presbyterian Church of Lexington, Kentucky, and has served as a Board Member of both the Opportunity Workshop in Lexington and the University of Kentucky College of Law Alumni Association. He was chairman of the Kentucky Democratic Party in 2004. Bill is a member of the Board of Governors of the Prichard Committee for Academic Excellence. Bill is also a member of the Visiting Committee of the University of Kentucky College of Law. *Martindale-Hubbell is the facilitator of a peer review rating process. Ratings reflect the anonymous opinions of members of the bar and the judiciary. Martindale-Hubbell® Peer Review Ratings™ fall into two categories - legal ability and general ethical standards. AV®, BV®, AV Preeminent® and BV Distinguished® are registered certification marks of Reed Elsevier Properties Inc., used under in accordance with the Martindale-Hubbell certification procedures, standards and policies.